NORTH BAY, Ont. — The North Bay Battalion made right-shot centre Liam Arnsby of the Don Mills Flyers minor midgets the first of its 16 picks Saturday in the Ontario Hockey League’s Priority Selection. Arnsby was the ninth player taken in the 15-round process conducted over the Internet. The Battalion, with its management and scouts headquartered at Memorial Gardens, chose 10 forwards, comprising four centres, two left wingers and four right wingers, five defencemen and one goaltender. All were born in 2003. 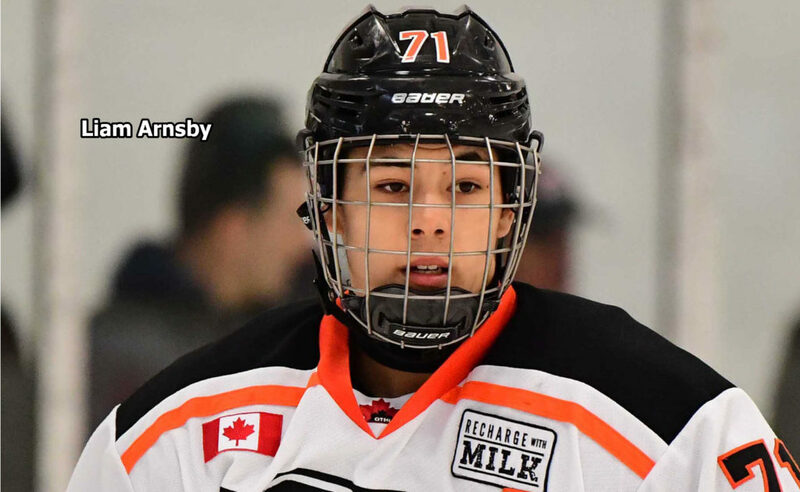 Arnsby scored 21 goals and earned 49 assists for 70 points in 49 games for Don Mills, which went unbeaten in regulation play and won the OHL Cup tournament. Arnsby, a five-foot-10, 166-pound resident of Ajax, Ont., turns 16 on Nov. 20. 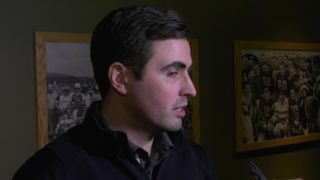 He was one of four Flyers chosen in the first round, including three of the top four picks, and one of three selected by North Bay. The Battalion’s second-round choice, 38th overall, was right-shot defenceman Paul Christopoulos, a Don Mills teammate of Arnsby who recorded 22 goals and 45 assists for 67 points in as many games. Christopoulos, five-foot-10 and 181 pounds, is a Richmond Hill resident who turned 16 on March 26. With two picks in the third round, the club used the first, 50th overall, on Christopoulos’s twin brother, Alex, a five-foot-10, 190-pound right winger who had 49 goals and 44 assists for 93 points in 73 games for Don Mills. The Christopoulos brothers are the first twins chosen by the Battalion since centre Blair McLaughlin and defenceman Cam McLaughlin were taken in the seventh and eighth rounds respectively in 1998 before the franchise’s inaugural season at Brampton. They combined for two goals and 11 assists for 13 points in 126 games in the club’s first two seasons. North Bay’s second pick in the round, 54th overall, was used on left winger Justin Ertel of the Toronto Red Wings minor midgets. Ertel, a six-foot-one, 186-pound resident of Mississauga, had 61 points, including 27 goals, in 70 games this season. He turns 16 on May 27. Ertel’s grandfather Bob was general manager of the North Bay Centennials, and his father, Tyler, played for the OHL predecessors to the Battalion. The Troops tabbed right-shot defenceman Ty Hollett of the Navan Grads midgets in the fourth round, 64th overall. Hollett, six-foot-two and 197 pounds, registered four goals and 18 assists for 22 points in 45 games. A resident of Orleans, Ont., he turns 16 on Aug. 27. With the first of three fifth-round picks, the Battalion selected left-shot centre Steven LaForme of the Brantford 99ers minor midgets at 91st overall. A six-foot, 183-pound resident of Hagersville, Ont., LaForme produced 18 goals and 28 assists for 46 points in 33 games. He turned 16 on Feb. 7. The OHL made a ceremonial selection of onetime Don Mills goaltender Roy Pejcinovski with the 74th pick, pushing all subsequent overall numbers back by one. The 2003-born Pejcinovski, who wore No. 74, was killed with his mother and a sister in an alleged domestic attack in March, 2018. The Battalion tabbed right winger Clint Levens of the Florida Alliance under-16s with the 94th overall choice. The first of three American-born picks, Levens, a resident of Ellenton, Fla., 40 miles south of Tampa, recorded 14 goals and 13 assists for 27 points with 117 penalty minutes in 20 games. Levens, six feet and 165 pounds, turns 16 on June 19. The Battalion’s final pick in the round, 99th overall, was left-shot centre Joshua Ziliotto of the Burlington Eagles minor midgets. A six-foot-one, 178-pound Burlington resident, Ziliotto had 21 goals and 14 assists for 35 points in 25 games. He turns 16 on April 15. The Troops, who didn’t have a sixth-round pick, pegged left-shot defenceman Erik MacNiel of the Quinte Red Devils minor midgets in the seventh round at 131st overall. A resident of Cobourg, Ont., MacNiel, six-foot-one and 165 pounds, had two goals and 10 assists for 12 points in 33 games. He turns 16 on April 25. Without an eighth-round pick, the Battalion used its next selection, 171st overall in the ninth round, to choose left winger Devon Savignac of the Sudbury Wolves minor midgets. The Garson, Ont., resident had 20 goals and 12 assists for 32 points in 24 games. Savignac, five-foot-nine and 155 pounds, turns 16 on April 17. North Bay’s 10th-round pick, 193rd overall, was left-shot blueliner Cameron Gauvreau of the Hamilton Jr. Bulldogs minor midgets. Gauvreau, six-foot-two and 180 pounds, had eight points, including three goals, and 70 penalty minutes in 31 games. The resident of Binbrook, a community in southeastern Hamilton, turned 16 on March 8. In the 11th round, 211th overall, the Battalion tabbed left-shot defenceman Aidan Shepard of the Toronto Marlboros minor midgets. Shepard, a six-foot-five 180-pounder from Toronto, had nine goals and 32 assists for 41 points in 72 games. He turned 16 last Monday. Left-shot centre Bill Gourgon of the Carleton Place Canadians midgets was chosen in the 12th round, 231st overall. Gourgon, a resident of Carp, Ont., had 16 goals and 13 assists for 29 points in 45 games. The five-foot-nine, 171-pounder turned 16 on Jan. 11. The Battalion looked to the United States in the 13th round, tabbing right winger Kevin Perrott of the Oakland Jr. Grizzlies 15s with the 251st overall pick. Perrott, who hails from Columbia Station, Ohio, part of Greater Cleveland, scored 11 goals and added three assists for 14 points in 20 games. Perrott, five-foot-11 and 190 pounds, turns 16 on May 6. The Troops headed south of the border for their 14th-round pick, choosing right winger Will Donato from The Hill School in Pottsville, Pa., 271st overall. Donato, six foot-two and 210 pounds, had five points, including one goal, in 18 games. A resident of Collegeville, Pa., 30 miles northwest of Philadelphia, Donato turned 16 on Jan. 10. The club exercised its 15th-round pick, 291st overall, on goaltender Owen Wray of the North Bay Trappers minor midgets. Wray, whose father, Scott, played for the Centennials and is an assistant coach with the Battalion, made 16 appearances last season. A North Bay resident, the five-foot-11 182-pounder turned 16 on Feb. 26. The Kingston Frontenacs, who held the first overall pick, selected Don Mills centre Shane Wright. Wright, who turned 15 on Jan. 5, was granted exceptional player status by Hockey Canada to be eligible for selection this year. Wright is the fifth OHLer to be eligible a year early, after centre John Tavares in 2005, defenceman Aaron Ekblad in 2011, centre Connor McDavid in 2012 and defenceman Sean Day in 2013. Tavares, Ekblad and McDavid were chosen first overall in their respective seasons and later went No. 1 in the National Hockey League Draft. Including Pejcinovski, there was a total of 303 picks.